My wife Nan and I, along with a good friend from college, J.D. Sawyer, who was living back on the east coast, had a unique experience one Saturday evening in Hollywood, back in the late 1980s. J.D. was out on business and stayed with us for the weekend. Living in Pasadena at the time, we had a number of ways to spend a Saturday evening. He suggested we take a trip down to Hollywood. I didn’t realize it at the time, but J.D. held an ulterior motive of hoping to run into a “movie star,” giving him “bragging rights” to his 16 year-old sister back in New Jersey. 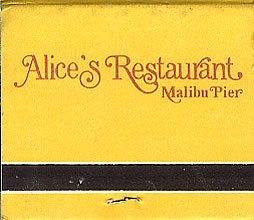 After eating a late supper, we ventured out to catch a dessert and coffee on a Malibu pier that had become famous as a star-gazing haunt called Alice’s Restaurant. As we sipped coffee, listening to the waves lapping below us through the open windows, J.D., true to his ulterior motive, quizzed the waitress about who had been in that evening, and she listed them off: Billy Joel and his then-wife Christie Brinkley, Larry Hagman (J. R. from Dallas), and musician Rick Springfield. With dessert and coffee now over, and perhaps a let-down feeling held by J.D., we ventured across the street to a small liquor store so he could purchase a post-card to mail back to his sister. As he and Nan were looking at cards, I was looking around the store at other people. Suddenly out of my mouth blurted the words, “Oh, my gosh, it’s Charlie Sheen.” This was just a year after the original movie Wall Street had aired, so his status as a celebrity was secure in my mind. We headed back to the car and I chided with J.D. for not shaking Charlie’s hand as that would have been a perfect story to share with his sister. Now feeling more emboldened, he headed back into the store and not only met Charlie, but Charlie’s date, actress Kelly Preston. It was a wonderful ride back to Pasadena. J.D., and I made a pact to watch Wall Street again the next morning. After giving ourselves high fives again and again over the experience, I caught my breath and became more reflective. I said something like, “we’re making such a big thing over this, but in a thousand years from now, Charlie will probably say that back in 1988 he met three saints of God in a Malibu liquor store.” We had a great laugh. At that time I held a more exclusive theological view of God, and how He viewed humanity. Wrongly so, I thought that God only included a “select few” in His master plan of salvation, and certainly not those who held the headlines of the day. Today, I, along with readers of this blog, know how small that exclusive view is. We now celebrate that God has included all of humanity in his love…even if they do have a little “tiger blood” in them. Don’t we all from time to time? As we look forward to what 2015 offers us, let’s celebrate that the Gospel changes how we view all humanity, our brothers and sisters in Christ, whether or not they have a clue they are included in His love. « Why In The World Was God Baptized?! It’s good to hear from you my friend. Your comments and blogs are much appreciated.